I don’t make cookies often, not because I don’t like to eat them (au contraire! ), but because I had the mistaken impression that they were pretty time consuming to make. For some reason, I thought that it would take a few batches in the oven to finish all the cookie batter and that each batch needed to be baked separately…This is as opposed to a cake, in which all the batter goes into one cake pan, or muffins where all the batter can be portioned into twelve silicon cups! Well, not anymore. Ever since I created this super simple, all occasion, vegan, plant-based, egg-free, dairy-free, gluten-free cookie recipe, my whole perspective on cookies has changed. As I write, I am savoring the last of these cookies I baked and trying to decide when is the soonest I can make them again, because they are simply SO delicious. In fact, to be honest, this was one batch I pretty much ate all myself, apart from giving a token few to my family (plus some to a neighbor)! That’s why I’ve decided to call these Super Addictive ‘Can’t Stop Eating’ Little Vegan Cookies. In fact, my husband just remarked that he didn’t seem to get that many cookies to eat himself this time…I love the fact that this recipe uses no white sugar, brown sugar or additional sweeteners, are quick to make and involve minimal kitchen equipment (no mixers needed)! To make these cookies nut-free, simply use a seed butter in the recipe instead, such as sunflower seed butter, pumpkin seed butter or soy nut butter (if you are not allergic to soy). If you are not vegan or don’t have a dairy allergy, you can use regular mini chocolate chips in this recipe. 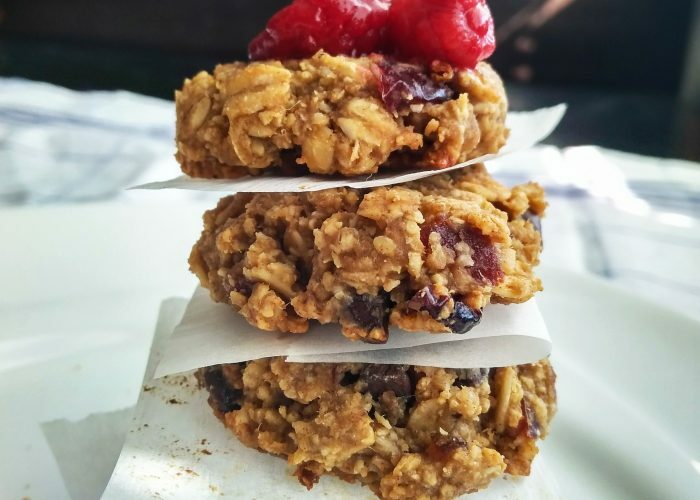 These nutritious cookies can be enjoyed at any time of the day, even for breakfast or as an evening snack. Bring them to the next party function, school classroom celebration or church event without having to worry about those being present having allergy or dietary intolerance reactions. Since these are healthy miniature cookies, you also don’t have to feel guilty about eating many cookies at once, and they are the perfect size for little hands to hold onto. This is one recipe everyone in the family can enjoy, regardless of their food preferences or allergies! A vegan, plant-based, egg-free, dairy-free, gluten-free cookie recipe that uses no refined sugar (white or brown sugar). Perfect for a snack, a treat or even breakfast! Meanwhile, soak dates in very hot water (just boiled) for 5 minutes. Then drain the water and dice up the dates. Combine the dry ingredients together in a large bowl and mix thoroughly, then set aside. Combine the wet ingredients (including the diced dates) together. Add the wet ingredients to the dry ingredients and mix until a smooth cookie batter is obtained. Portion out the cookie batter in one tablespoon amounts (using a measuring spoon) onto a baking sheet lined with parchment or wax paper. Use the back of your spoon to flatten each mound slightly. It is best to let the cookies cool at least 5-10 minutes on the baking tray, as the cookies will harden up slightly upon cooling. If you have more of a sweet tooth, add in a teaspoon or two of maple syrup, agave nectar or honey (for non-vegans). If you don’t have any unsweetened or sweetened dry coconut flakes or shredded coconut on hand, you can omit this from the recipe. If you don't have pitted dates on hand, you can substitute the amount of dates in this recipe for 2 tablespoons of well mashed ripe bananas. For best results, use oat flour in this recipe. However, if you don't have oat flour available, you can use white all purpose flour as a substitute. To make your own oat flour, blend up rolled or old-fashioned oats or quick oats in a food processor or blender until fine. For those who are gluten-free, choose gluten-free certified oats. If you want to be adventurous (or don’t have dried cranberries available), you can try this recipe with other types of dried fruit like diced dried mango, raisins or figs. This recipe was so easy that my child was involved in the mixing and portioning of the cookie batter onto the baking sheet (she thought it was great fun), and everyone enjoyed the results. Apart from the delicious taste of these cookies (warm from the oven or cold the next day) it was rewarding just to enjoy the heavenly fragrant cookie smells wafting from the oven to the rest of the house. And yes, you might as well make a double batch at the same time, because these little cookies do freeze well! These cookies are amazing. You won’t want to stop eating them!